Stertil-Koni SKYLIFT is a superior heavy duty platform lift with a true, vertical rise with no crossbeams, no overhang and no base frame. This provides free access from all sides. 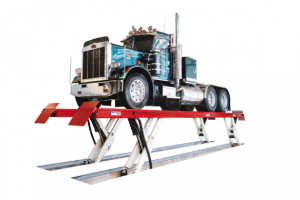 The SKYLIFT can be installed flush mounted or surface mounted and is available in various lengths and capacities to accommodate your lifting needs. There is even a wash bay model that features hot-dip galvanized platforms and a water tight stainless steel control box.